Having an ironing station (a place for everything, everything on its place) can help a lot: gather there all your pressing tools so they are easy to reach when you need them and ready for you to use; seeing them there will remember you that they exist and you will use them a lot more. I know this may seem just a sweet dream for a lot of you (and I've been there me too for too long), but dreams are there just to be realized! sand until they're rounded two of the four long edges of a long wooden stick with a rectangular section (like we did). Don't have a useful husband who can DIY? Check out clappers and steam sticks that you can buy HERE. Another fabulous pressing tool DIY: I've made this one all by myself (and you can make yours too, following my step-by-step tutorial!) 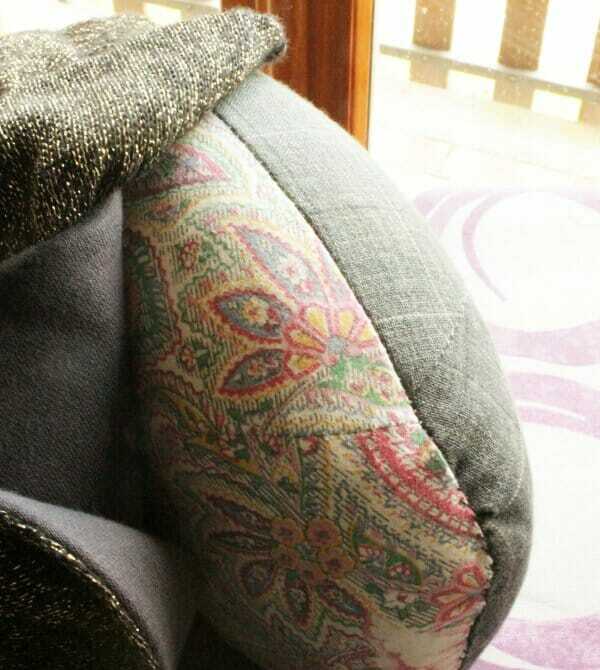 using hamster sawdust and scraps of fabric… it's that easy! 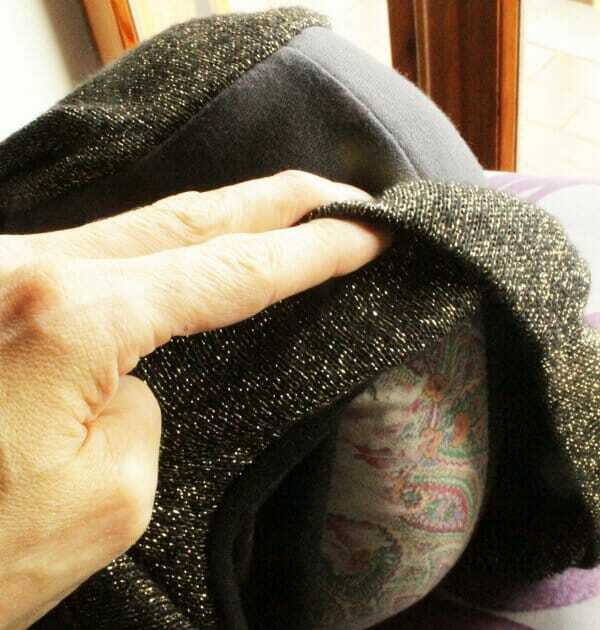 It's great to press flat seams into curved shapes, read: collars, princess seams, hip seams, darts. If you've ever tried to press that kind of seams above a flat surface, like your ironing table, you've certainly experienced wrinkles and puckers: it won't happen anymore with your tailor's ham! Just turn it in your hands until you locate a curve that mimics the final shape of that seam on your garment, steam press the fabric and let it get cold before you move it, to perfectly set the crease. You can manipulate so it lays on the long side: or even make it stand on the short side (help yourself placing it above a football display ring, if you have it available) to iron a sleeve cap: Note that it has two different sides, one is made with cotton (for fabrics that can handle high temperature and steam) and a second is made of wool, for delicate fabrics (like wool, cashmere, silk…). Don't want to make your own? Check out the options on Amazon to buy a Tailors Ham. A lot of sewers do not give press cloth the importance they deserve. I have several unconventional press clothes, and I cycle through them, depending on the project I am going to sew. The ones I use more are the cotton ones, but I'm planning to add a silk organza press cloth to my arsenal too, because of its transparency that would allow me to see through it. Other pressing clothes are made of mesh (I have one but it's not my favorite: it tends to leave square stamps on the fabric) or Teflon (they are usually called applique non-stick pressing sheets, or something like this). 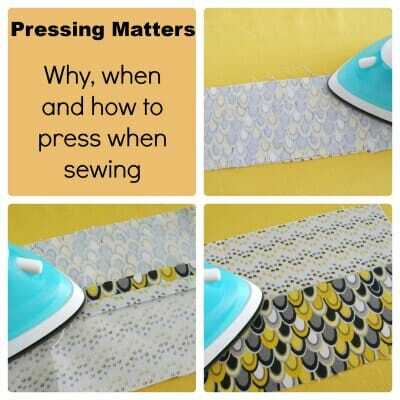 If you use fusible interfacing, protect your ironing table AND your iron using 2 press cloths: one below your project and one between your project and the iron. This way you won't ruin anything if a bit of glue goes out of control (it happened to me “a few” times: it's not fun to take the glue off!). Wash them right after using them to iron on interfacing (or appliquè) to be sure you don't make a mess, using them the wrong way next time! Wanna DIY? 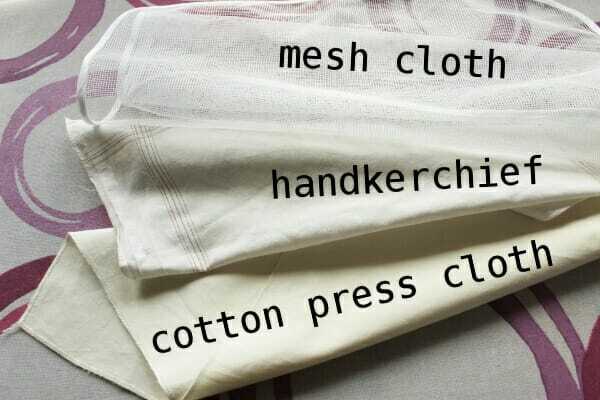 Most of my cotton press clothes are old handkerchiefs, but you can easily make yours serging the edges of a squar-ish piece of muslin. Prefer to buy a professional pressing cloth? You can find some here. I can't imagine my pressing station without it: first of all it tames all those rebel knit fabric rolling edges. Another great use for spray starch is to add body to denim fabric, giving it a little protection from dirt and stains (and this is why I use it to press the fabric I use for all my bags, like the laptop padded bag). If you use quilting cotton, you know that after pre-washing it, it partially loses some of the stiffness it originally had because of the chemicals they put on it during the industrial production. 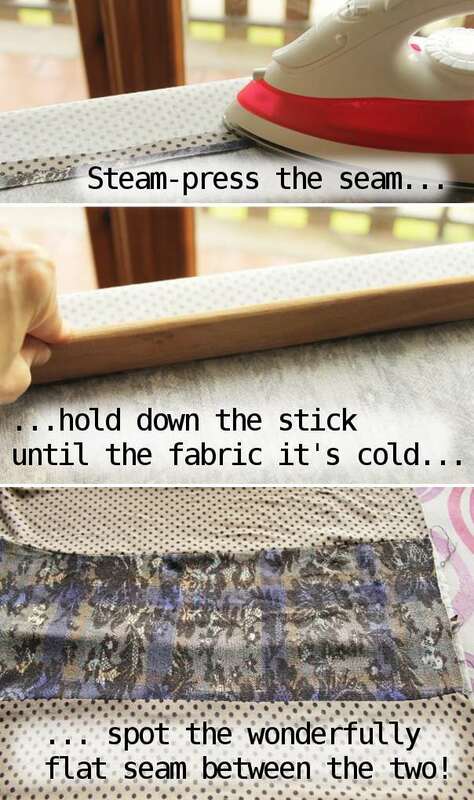 Substitute them with some spray starch, to give back some body to the fabric that will then be easier to work with (and it won't shrink at the first wash, since you already pre-washed it!). It's important that you spray starch right before you press the fabric, section by section: don't let the spray dry on your fabric without ironing it, or you may end with starch stains. If you like, you may try making your own: mix cornstarch powder with water (1-2 Tsp into 1 cup, more or less), shake vigorously… et voilà, here's your spray starch. I buy the canned one, because I've experienced starch lumps in my sprayer bottle and I hate them! I've read you can boil this homemade stuff to avoid lumps but I've never tried: do you have any feedback on this method? 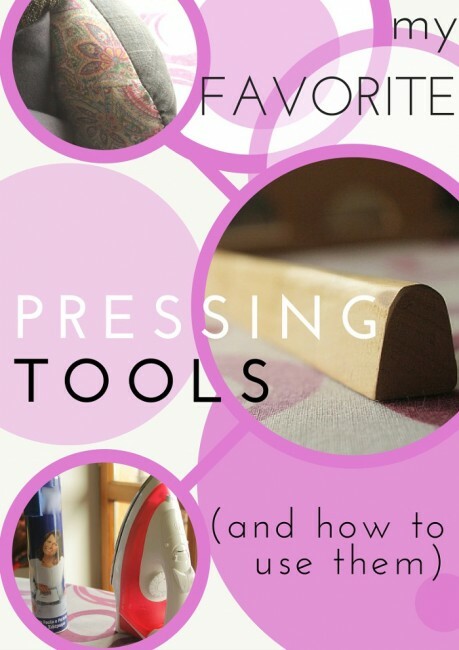 Now it's your turn: what's your favorite pressing tool? And why? Share your tips, I'm eager to learn! 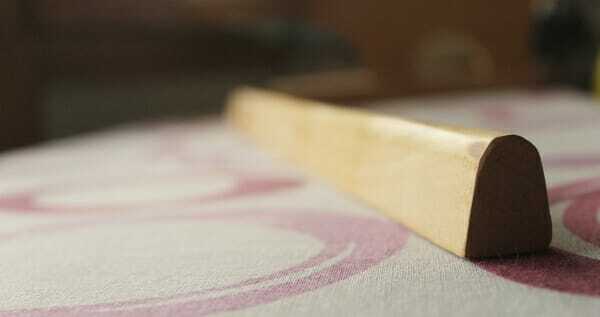 I love the Clover 7811 Hot Ruler Press Perfect. 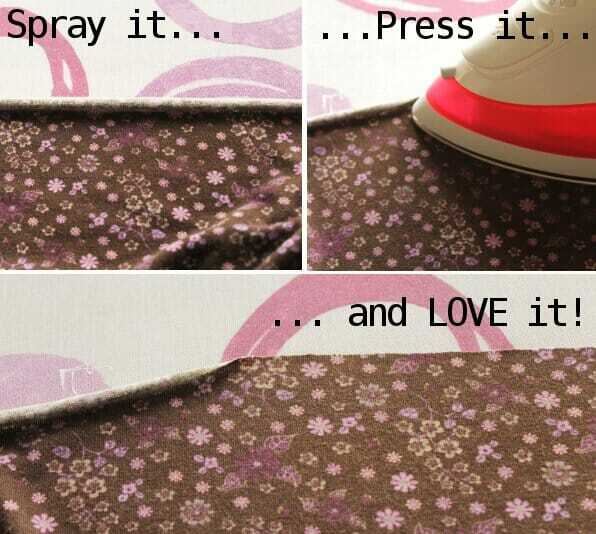 It makes pressing hems so much easier! I wish it came in a longer size! Thanks for the tip:) I have never used it, will give it a try. Thank you Janet! it is a pleasure to share with you! 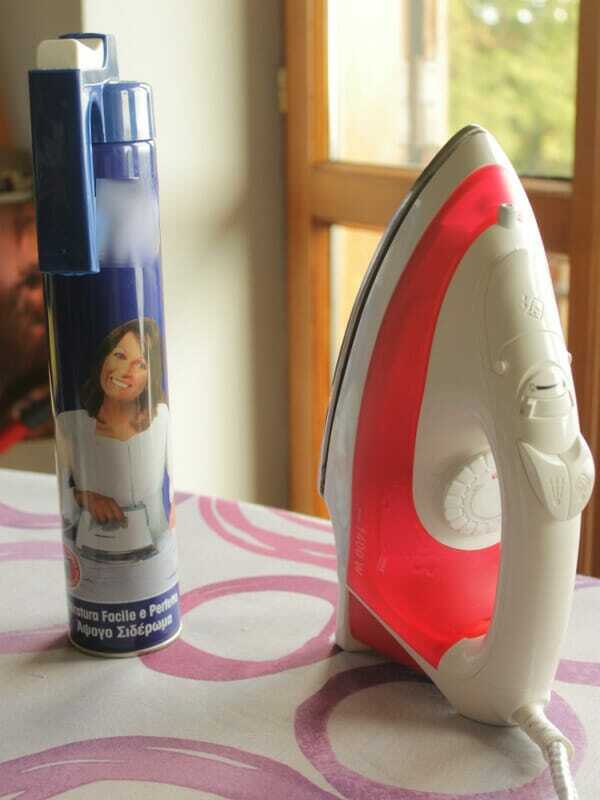 I have a couple of useful tools the first is a clover mini iron. Really useful for baby or dolls clothes and tiny seams or hems,and also a heated ball which is interchangeable and curves petals when making flowers. The other thing is a Rajah cloth. I found it on Ebay UK and I think it came from an Australian site. Nothing burns and I can actually pleat leather with it. Both are wonderful additions to your ironing center but I must get one of your pressing sticks and make a ham. Thank you for the information. Today I was sewing a hat and wondered what I would have done without my ham. All I seem to be missing a fancy wooden point presser and those thermal thimbles. Must get some! Debi, your blog is one of the very few I actively anticipate. I read others that I’m happy to see when they show up in my inbox, but I don’t think about them beforehand, wondering what they’ll say. I really appreciate your down-to-earth approach – one doesn’t need to be an expert to understand it. I have been sewing for 55 years, 12 of them professionally, and I’m still learning, like using thermal thimbles. They weren’t available when I sewed for a living, how I wish they had been! 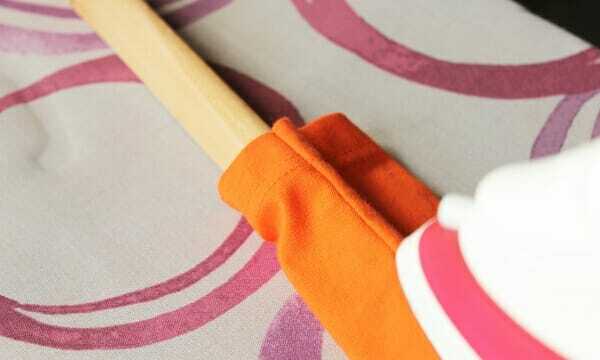 I love your idea for a pressing stick. I have an old tailor board which performs the same function, but it’s too large to get into narrow sleeves. I’m going to try to make one like yours. Thanks for the great idea! almost always find sleeve boards, sewing hams and sewing rollers at thrift stores. My seam stick is a piece of half-circle wooden trim from the local Home Depot. They will cut to length any pieces of trim if you ask….and in this case, someone else had taken the first 6′ of the 8′ piece, so it was ready for me to grab (and as a cut “scrap” it was less expensive per foot than the full piece. lase help figure out a way to keep spray starch OFF my iron. I have tried most of pinterest but to no avail. I also tried stuff foe cleaning HOT iron. This has had so success but burnt fingers are inevitable and must be done after each session and while the iron is still hot. Pressing clothes absorbe the spray so they are not useful. Recently. I bought a ‘cloth’ that looks like a fine mesh screen. I have used it minimally but my impression is that I can’t get the iron hot enough now. Any ideas? Try one of those Mister Clean white sponge. I just get the iron on hottest setting get the sponge quite wet lay it on your ironing surface and iron the sponge back and forth. Hope it works for you. Great post. I pretty much only use my iron and ironing board when sewing too. My 10 year old grandson asked me to help him with making stuffed animals. He now knows how to use the sewing machine and the importance of pressing. The second stuffie he did, before he turned it he said now we have to press right Nannie. 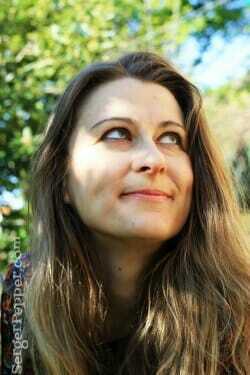 Big smile on my face. He’s using all the tools in my sewing room. We are having a great time together.